Senior dogs are more sensitive to heat, than they were when they were younger. A dog can be considered a senior dog at the age of 7, for small and medium size dogs, larger breeds at the age of 6 and for giant breeds like Great Danes, Newfoundlands, etc., they are considered senior at the age of 5. 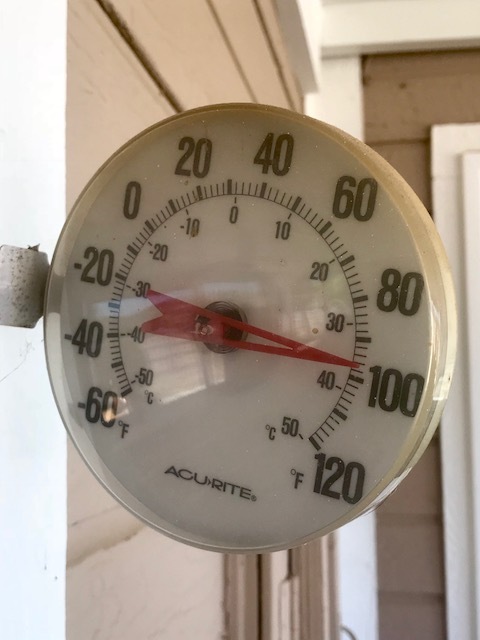 Thermometer; always in the shade of the patio. With this in mind, senior dogs can more easily be victims of heat exhaustion than younger dogs, even in the shade with no exercise. A dogs normal body temperature is between 101 and 102 and they can overheat quickly, way before we notice the signs. Signs of heat exhaustion often go unnoticed until it’s too late. Learn these signs, so that you can manage your older dogs environment to keep him cooler in the hot summer months ahead. The pictures you see here are the same dog taken within 15 minutes of noticing the signs of heat stress. The last picture is taken 5 minutes after being gently and slowly hosed down with water and standing, then laying on the wet patio floor. It doesn’t take long for a senior dog to go into full on heat exhaustion and when noticed early, you can prevent this from happening. As the symptoms progress and go unnoticed, the dog’s body temperature increases and signs become even more serious. In most cases, heat exhaustion is preventable. Always have fresh water available. It’s ok to skip exercise on those really hot days. If you do exercise your dog, please do it in the early morning hours and keep it light. Bring water for both of you. Dog’s won’t regulate themselves, so it is our duty to know these signs to ensure their safety. Never leave your dog unattended in your car, even if the temperature is mild. In a locked car, the temperature can climb rapidly to 110 or more, in a matter of minutes. A cracked window will not prevent your dog from overheating and suffering heat stroke. You may have parked in the shade when you left your dog, yet the sun shifts and an unexpected delay could endanger your dog’s life! Again, senior dogs are more sensitive to heat, so it’s best to leave your dog home. Dog’s should have access to shade and fresh water while outdoors. 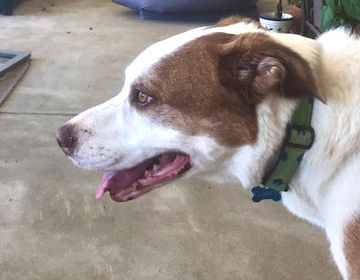 If the temperature is hot, outdoor access should be limited to short periods of time and it’s best if a senior dog can be housed indoors. If you must leave your dog outside for hours on end, please get a pet sitter to come in and check on the dog. 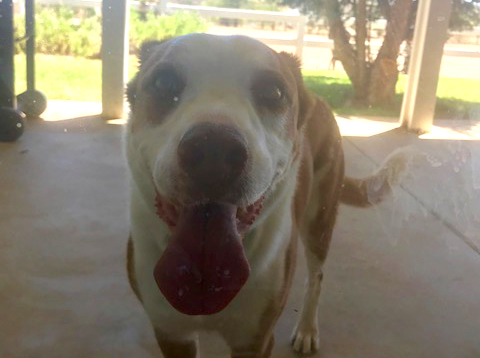 Better still, get a doggie door installed, so they have access to the home and outside when it cools down. Get a baby pool and fill it with water to a safe level for the size dog you have, so he can cool himself off as he chooses. Change or refill water bowl a couple of times a day and make sure you let the hot water run out of the hose before refilling the bowl. Ice cubes in the bowl keep it cool and are fun even for senior dogs. 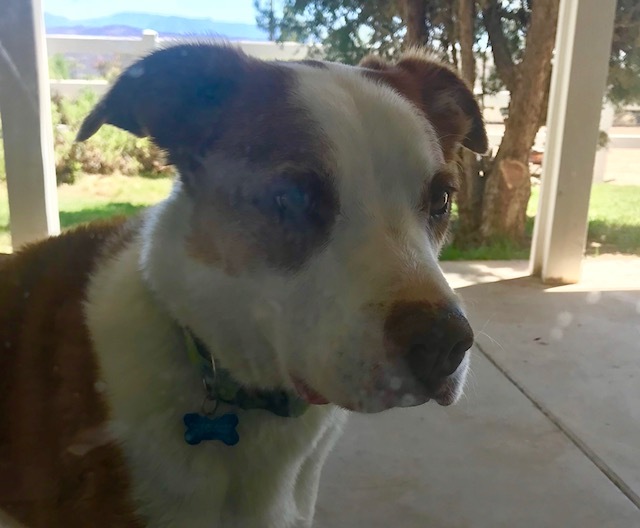 Preventative care and using great caution with senior dogs that are obese, have respiratory difficulties, or are otherwise unhealthy can save their lives. These dogs are be more prone to heat exhaustion than other dogs and it happens very quickly. They need our help to keep them safe and comfortable. Same dog who was previously showing signs of heat exhaustion, 5 minutes after being hosed off with water. Notice, a closed mouth, alert, no panting, ears forward. Happy dog! If you believe your dog is suffering from heat exhaustion, seek veterinary care immediately. When they are at this stage they will often times refuse water when offered, however, it’s important to begin to cool their body down. You can do this by putting room temperature water directly on them, by wetting a towel and asking them to lay down on it. Wetting their feet helps cool them down too. Don’t use cold water as it can worsen the situation.